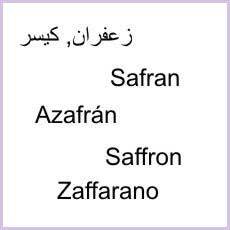 The origin of the word saffron comes from an Arab word "az-za'fran'. This Arab word simply means "will be yellow". The term was later incorporated into the Latin word and it evolved to 'safranum'. No matter what the language is, the structure of the word remains similar. In Sanskrit, the sacred language of India, plants are usually named after their developing region. The sun today means saffron in some parts of India, "kashmiram", i.e. product of Kashmir. In ancient Greek, saffron was known as "krokos". This was the name that was used to depict the spice of Homer. In modern Greece, the name 'zafora' was replaced with another term. This ancient Greek word lives on in the Latin language and it refers to the botanical name of saffron, crocus sativus.